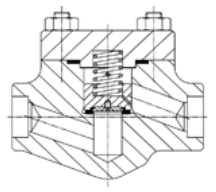 Valve disc is provided with antirota-tions pin. Full opening swing check valves to API 6D or API 6A suitable for pig passage are also available. Normally upto sizes 2”, (larger sizes are also available) both T-Pattern and Y-Pattern are available. Valves provided with double disc and spring. They are available with metal to metal seats and soft seats. 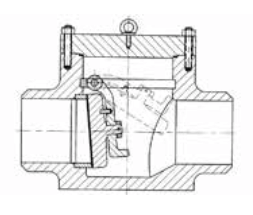 This design reduces substantially the weight of the valve as well as the face to face dimension. 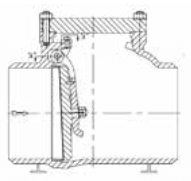 When the check valve must be operated by a very small pressure drop this design is used. Valve disc is balanced in such a way that very small variations of pressure open/close the valve. This reduces substantially the pressure drop across the valve. Used in the turbine steam extractions of power plants. 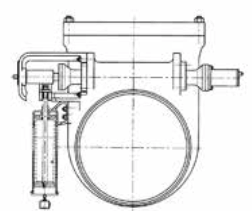 Valve is provided with a pneumatic piston and solenoid valve in such a way that when a closing signal is received in the solenoid valve the air in the pneumatic piston is released starting the closing stroke of valve disc and ensuring fast valve closing by fluid-media. In those cases when indication of check valve position is required the valve is provided with a position indicator and limit switches. 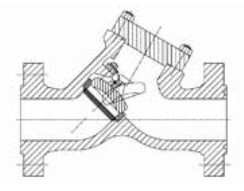 Also a operating lever is available in case proper rotation of hinge shaft must be checked. Normally used in the outlet of large size pumps or inlet of hydro power plant turbines. Valve can operate like a butterfly valve but also like a check valve by fluid-media.